A remarkable collection of religious items sourced from diverse lands was discovered during archaeological excavations on the Swedish island of Helgo. Located in Lake Malaren, to the west of Stockholm, this small island was an important Viking trading and manufacturing centre (6th-11th centuries AD). It has produced an enormous collection of artefacts, including numerous exotic finds such as Arabic coins, Frankish glass and metal-work from across western Europe. However, the most famous objects found were three precious items, now known as the Helgo treasure. Discovered close together, these artefacts included a Buddha from the Indian sub-continent, an elaborate crozier-head from Ireland and a bronze ladle from North-Africa. 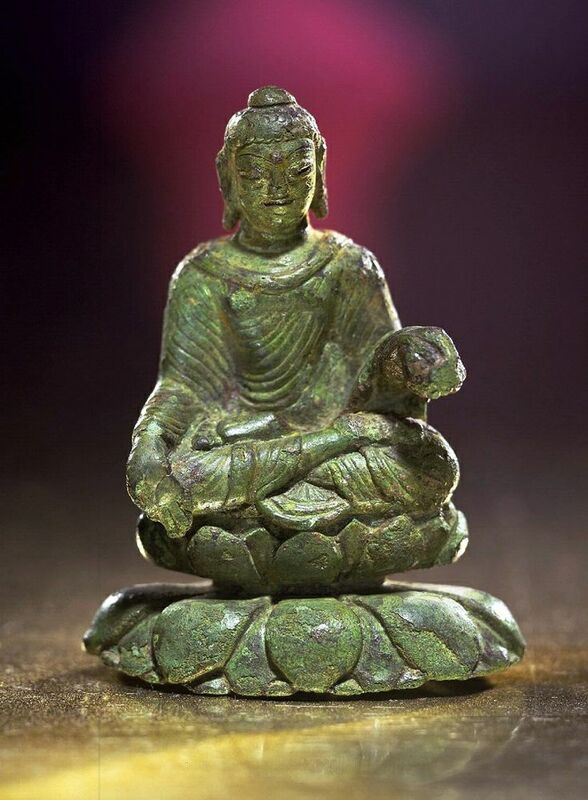 Undoubtedly the most extraordinary find discovered during the excavations at Helgo was a small, bronze Buddha. This devotional figure dates from circa the 6th century AD and was probably made in Kashmir, on the Pakistan/India border. The Buddha has a silver urna on his forehead, symbolizing the third eye, while the ears have long lobes, the insignia of royalty. He sits in a meditative pose upon a double lotus throne, the latter representing purity. The Buddha probably arrived in Helgo via Swedish merchants whose eastern trade routes were concentrated along Russian rivers such as the Volga. The Helgo crozier is probably of Irish origin and would have formed part of a bishop’s staff. Dating from circa the 8th century AD, it was most likely stolen during a Viking raid on Ireland and brought back to Helgo as booty. The crozier is fashioned out of bronze and is decorated with enamel and coloured glass inlays. Its curving terminal appears to depict the biblical tale of Jonah trapped in the mouth of a whale or sea-monster. 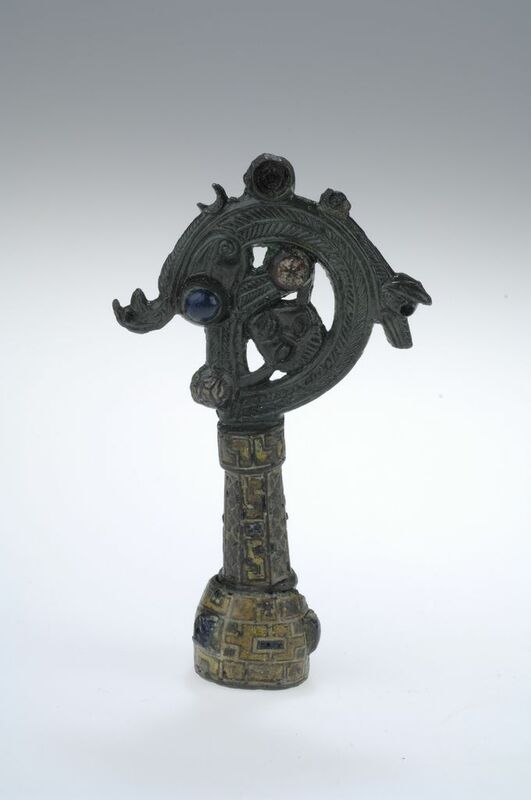 A similar decorative motif is also employed on a broadly contemporary crozier from Aghadoe in Co. Kerry. 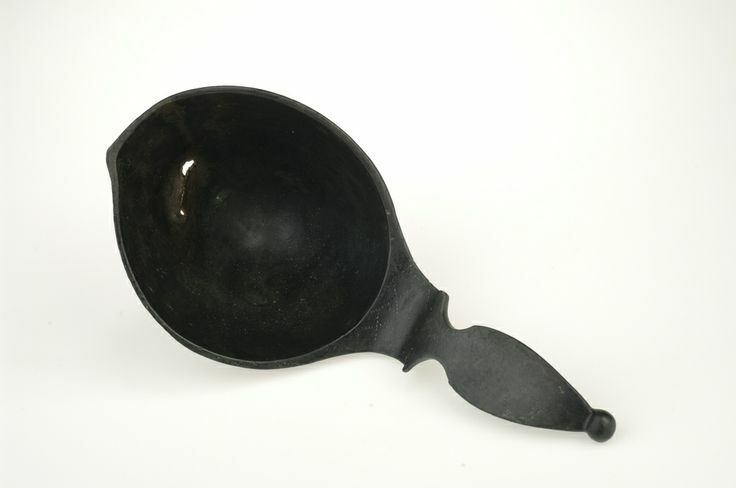 The third object from the Helgo treasure is a bronze ladle whose origins lie in North Africa, probably in the vicinity of modern-day Egypt. Decorated in small punch-marks, which define a Tree-of-Life symbol, the ladle was most likely used in ceremonies associated with the early Coptic church. It may have arrived in Sweden via Scandinavians who had visited the Mediterranean. Indeed, it appears the Vikings were quite active in this region and there are a number of accounts of Norse attacks on the Iberian peninsula and north Africa. In addition, many men from Sweden and the surrounding lands joined the Varangian Guard, an elite unit of the Byzantine army, which was active from the 9th to 14th centuries. The urna (one of the 32 “lakshanas” supposedly found on all great beings) is a curl of three hairs. It does not represent a third eye. Urna: (31) “wool” a mark or whorl of hair on the forehead or between the eyebrows. 2. Usnisha (32): a “crown” a bun of hair or sometimes called a “cranial protuberance” [?] which is considered to be a sign of his attainment or Enlightenment. Lama, perhaps the non-India population’s idea of the ‘urna’ representing the ‘third eye’ is merely their misunderstood interpretation of the word – Enlightenment.